A weather prediction model computes the weather forecast on a numerical grid. This grid has a resolution, much like a digital photographor any other computer image. The higher the resolution, the finer the model grid and weather patterns can be resolved with higher level of detail. 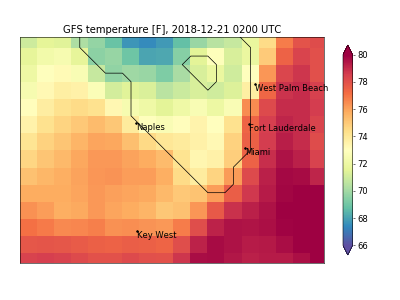 For example, outputs of the Global Forecasting System (GFS) are publicly available at a coarse 0.25 degree resolution (approx. 27 km). As you can see from the image below, this makes for a rather blocky and low-definition weather forecast. 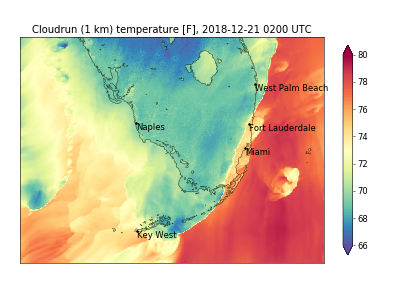 In contrast, Cloudrun allows you to run extremely high-resolution forecasts at up to 1 km. At this resolution, fine-scale weather patterns can be resolved with astonishing level of fidelity. Different applications and needs call for different model resolution. As a general rule of thumb, we recommend that your resolution in kilometers is approximately equal to the length of the forecast in days. For example, a 1-km forecast is likely to perform best in the first day or two. On the other hand, a skillful medium-range (5 to 10 days out) forecast can be made with grid resolutions of several to a dozen kilometers. This is due to the so-called butterfly effect, one consequence thereof being that the model error grows faster on smaller scales than on longer scales. Because our system automatically scales the resolution with the region size to achieve consistent compute times and cost, you can control the resolution by changing the forecast region size. Please reach out at help@cloudrun.co if you want to create forecasts with custom region size and resolution settings. Weather systems can be highly localized and subject to small scale forcings such as urban areas, coastlines, or steep topography. If you use a low resolution, public model forecast, these hyperlocal effects won't be resolved in the data. Further, these small-scale, local effects affect the quality of the weather forecast on larger scales. If you're leading an expedition into a mountain range, or preparing for your next sailboat race, you don't want a coarse forecast for the surrounding 100-km area. You need a high-definition forecast that is specific and relevant to your route. If you're trying to predict weather conditions for your wind or solar farm, a coarse-resolution public model forecast is almost guaranteed to be less reliable. This is where Cloudrun comes in to help you create custom, high-definition weather forecast for your business, research, or recreation needs.